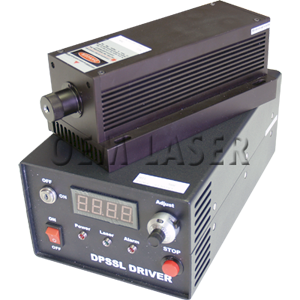 1030nm, 50mW DPSS laser system including diode driver with better than 5% power stability. The driver includes an LED display providing input current measurements to the diode. The driver also includes a manual output power control knob allowing manual output power adjustment from 0mW to the maximum rated output simply by adjusting the front panel control. Safety features include a key switch, remote interlock, ON/OFF switch, and beam on delay. The laser ships with laser head, power supply/driver, storage case and operating manual.